ColecoVision.dk Homebrew Section Presents: Dale Wick. Dale is the webmaster of Adamcon in Canada. Dale is also president for Metro-Toronto Adam user's Group. Dale lives in Toronto in Canada. His site basically about the Adam Computer. Dale is a programmer, and also into the homebrew scene for ColecoVision game console. One of his games are: Get Booty. You'll have to set the cannon to shoot and sink the ship. But time is pressing. Another are: Mist Maid. In the Mist maid you are in a boat near niagara falls. against you from the waterfall. Niagara. without falling in, all while being attacked with debris. The game was never finished. Frog magi is a very strange game. Also another test version of a game is Sword Fighting using Daniel's Toolkit. 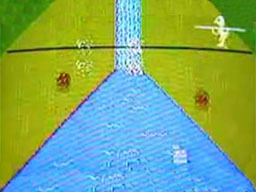 The game consists of two pirates fence against each other. Background image is digitized deck of a pirate ship. 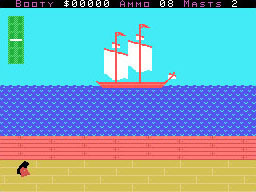 There are a lot of work with the game, you as a pirate must defend yourself from the other one. Seen with different eyes, you could very well be the attacker, and it is the second pirate who must defend himself. Left button for attack, and right button for perry. (low - medium - high). Joystick is for moving your pirate around. It is possible to: attack normally, Jump to attack and spin and throw attack. Perry attack will allow to throw or push to the other player. Super Action Bowling is the newest game Dale working on. Dale trying to finish Super Action Bowling. It is a concept game at the moment. Dale have a list of 20 or so changes to make for the next build. Ultimately Dale want to release the game as "A Bad Day". 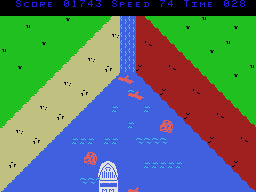 And that with a portion of the game where you drive up the freeway going the wrong way, and a portion of the game where you have to survive a sinking ship. Also a run and gun style game called Reckless Wizard. Dale says he will publish at least 4 new titles in 2012. Latest was Dale involved in Daniel Bienvenu's Jeepers Creepers. A re-release with box and manual was sold in several copies. Webpage : Dale Wick's videogame page.